This statistic gives information on the most popular gaming brands on Twitter, ranked by number of followers on the social network. 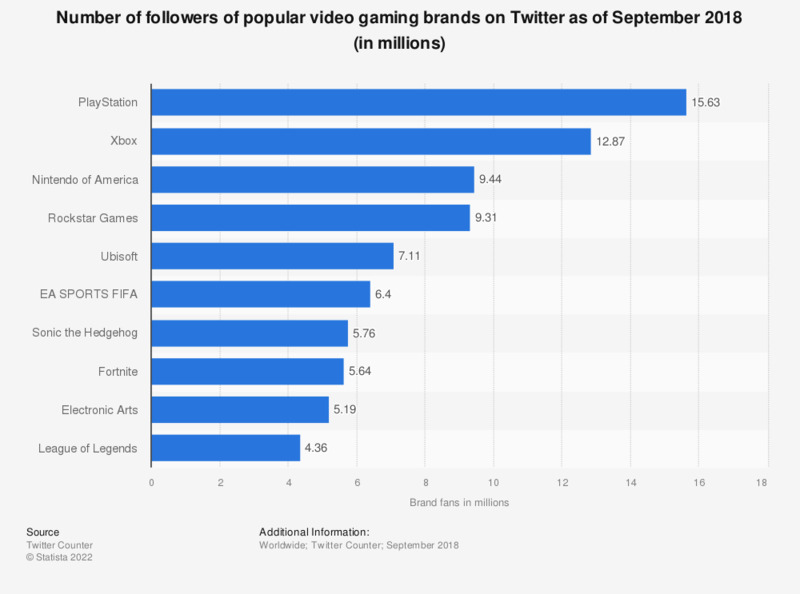 As of September 2018, Sony's PlayStation was ranked first with 15.63 million Twitter followers. Ubisoft was ranked fifth with 7.1 million followers. The PlayStation brand has seen a significant growth in popularity in recent years, due mainly to investments in technology and the introduction of the PS4 and PlayStation VR hardware. It comes as no surprise then, that the brand was a leader on Twitter in May 2016, having the highest number of followers among gaming brands. In fact, in 2016 the PlayStation brand created a lot of online buzz, and ranked first among top gaming platforms by number of online article mentions. Additionally, U.S. gamers surveyed in March 2016, identified Sony’s platform as their favorite gaming hardware. In line with this trend, 2018 saw an increase in developers working on PlayStation projects, compared with the previous year. The third most followed gaming brand in this ranking is Rockstar Games, sitting a little under three million followers shy of Xbox. The multinational game developer and publisher is responsible for introducing many popular game titles to the market, among them the Grand Theft Auto (GTA) series. The franchise is one of the bestselling titles worldwide. The highest selling GTA installment so far is GTA V. Released in 2015, the game had sold more than 62 million copies as of February 2018. In the 2018 fiscal year, Rockstar's parent company, Take-Two Interactive, generated 1.79 billion U.S. dollars in global revenue.